A new survey of artificial lighting has found that a third of humanity can't see the Milky Way at night, and 80% of all people live under light-polluted skies. 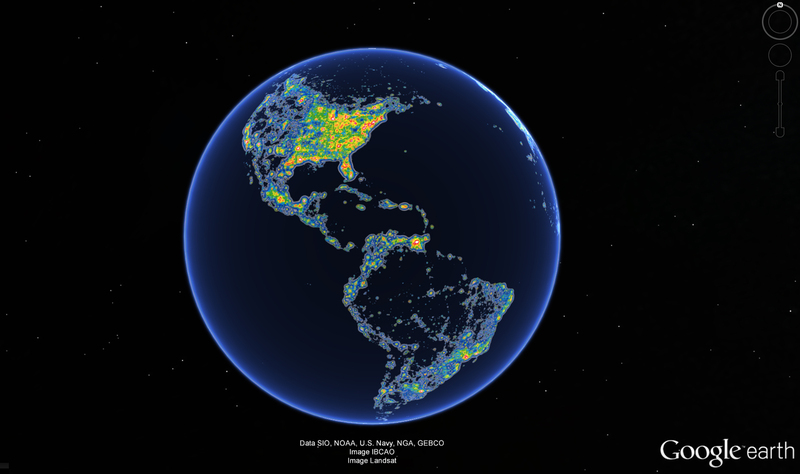 It is difficult to overstate the significance of light pollution. Light reveals, but if it gets too bright, it blinds – and there’s a derisive irony in there. By the light of stars, the first humans worked day and night to beat back the darkness around them. 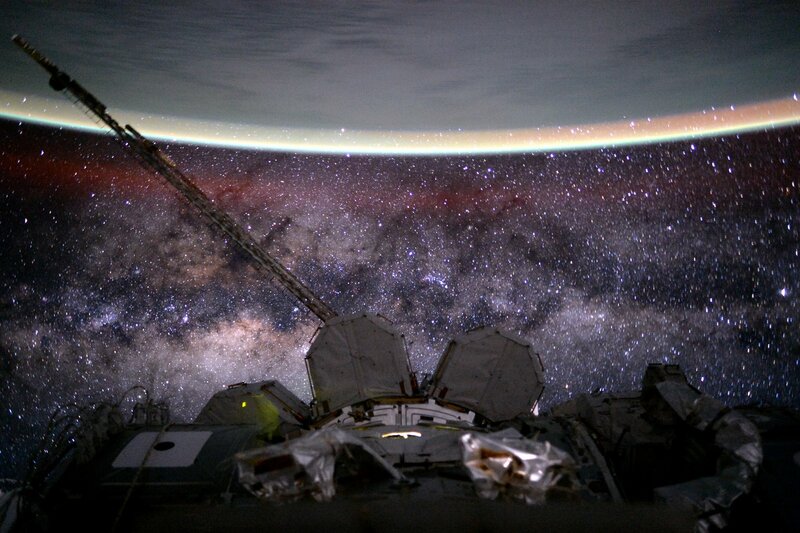 But today, more than a third of humanity can’t see the Milky Way at night because of artificial lighting, while at least 80% of all people “live under light-polluted skies”. What a miserable day that would be. 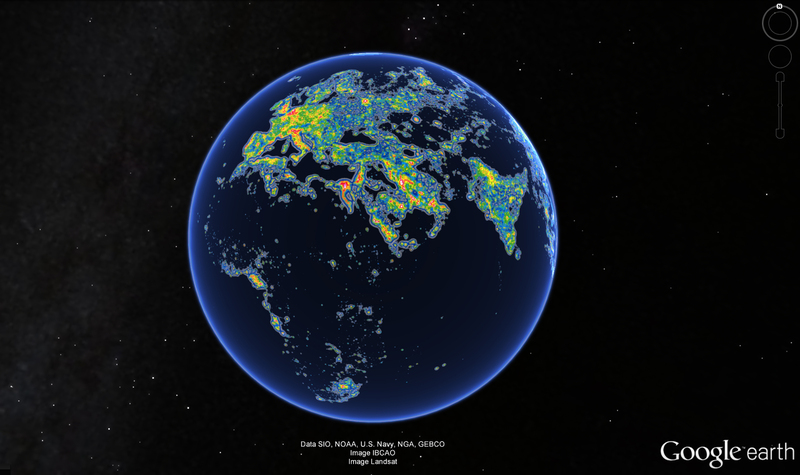 The authors of the survey used a combination of data collected by satellites and computer modelling to estimate the amount of light from artificial lighting that was turned upward, into the night sky. They were assisted in particular by sensors installed on the Suomi National Polar-orbiting Partnership (NPP) satellite, operated by the US National Oceanic and Atmospheric Administration (NOAA). Suomi NPP orbits Earth at 824 km in a Sun-synchronous orbit. Its VIIRS DNB sensor measures brightness such that each pixel in its images is 742 meters long, considered to be good spatial resolution. Though some of the readings – as well as the modelling – were confounded by forest fires, volcanoes, lightning, the presence of snow (which reflects light) and aurorae, the authors were assisted by scientists at the NOAA in filtering the data accordingly. The skies over the areas in light blue are 20% more polluted than normal, where the pollution distorts our proper vision of the horizon. Places where this effect extends to the zenith are marked in green. In areas in yellow (around 200%), the Milky Way is not visible in winter nights, when it is typically fainter; in areas in orange, our galaxy isn’t visible in summer nights either. In the areas in red, “people never experience conditions resembling a true night because it is masked by an artificial twilight”. In places marked in white, human eyes are at risk of not being able to adapt to the dark. On the one hand, light holds a special place in many human cultures, and the ability to manifest it is widely considered a symbol of progress. As the writer Jane Brox put it in 2011, “Before the advent of artificial light, humans had to go to bed when the sun went down.” The presence of street-lamps is thought to make the road or space it lights safer (although the jury’s still out on whether this is always the case). But on the other – as virtually all of India, central Europe and the North American east exemplify – our inefficient use of artificial lighting is blinding us to our stars over growing ranges of urbanisation. It’s easy for some to make this decision but it’s not the one we need to make quickly. 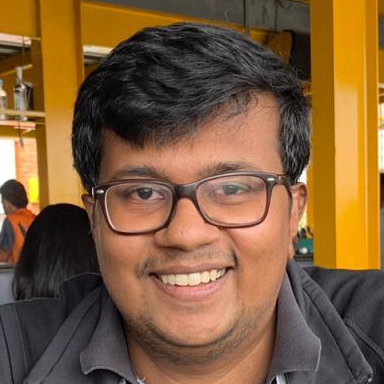 Instead, that involves the use – or disuse – of lighting that doesn’t cast light upward, smart-bulbs that become less bright when not in use (an opportunity Indian entrepreneurs have been encouraged to bank on) and, in general, not installing more power than is required. The authors of the study also recommend reducing the use of “‘blue’ light that interferes with circadian rhythms and scotopic vision”. In some places in India, however, the request could be far simpler: toward a sense of economy, and discouraging the use of artificial lighting as decoration. When political parties had been campaigning ahead of the recently-concluded Tamil Nadu assembly elections, sights like that in the image below were common throughout the state. Additionally, light interferes with many creatures’ timekeeping senses. Among birds, migration patterns, moulting and egg-laying periods are disrupted. Crows become better at evading hunting owls. Desert rodents are discouraged from foraging. The mating pattern of a species of ant (Atta texana) goes out of whack. The Salt Creek tiger beetle can’t mate in peace because the extra light allows predators to see it. Just-hatched sea turtles, used to thinking the sea is where the darkness is, are disoriented. Tadpoles of the African clawed frog metamorphose in lower numbers under brighter light. Some kinds of moths and spiders that guide themselves around using light become lost. And apart from interfering with photosynthesis, artificial light also affects photoperiodism, responsible for telling trees when it is dark – and so time for sleep or flowering. Cloud cover over or near cities and atmospheric pollutants can also increase the amount of reflected light, called skyglow. As human urban centres burgeon and occupy more land, so will the effects on the environment burgeon with them. In terms of having the most citizens who are affected by worse light pollution, Singapore leads the list: its entire population is in the ‘white’; however, it is also tiny. Four members in the Gulf Countries Council (Kuwait, Qatar, UAE and Saudi Arabia) have more than 80% of their population in similar straits. Saudi also leads in terms of being the most polluted of the G20 countries, followed by South Korea, Argentina, Canada and Spain. India is last on the list: 80% of Indians can at least see the Milky Way on summer nights. By far the continent with the most countries with pristine dark skies at night is Africa: more than 75% of the population of Chad, the Central African Republic and Madagascar – and more than 98% of the territories of Somalia and Mauritania – experience it. However, this status isn’t the outcome of good planning as much as low electrification. By 2015, only 32.7% of Somalia’s population had access to electricity; the other countries fared worse: Mauritania, 21.8%; Madagascar, 15.4%; Central African Republic, 10.8%; and Chad, 6.4%. And light pollution likely won’t be a big deal for someone angling for 100% from the PoV of 6.4%. The authors of the study are careful to note the effect their assumptions – such as of atmospheric transparency, the hour of Suomi NPP’s observations, oil-well- and gas-flares, haze, etc. – will have on their findings. However, barring atmospheric transparency, the other factors aren’t widespread, leaving us with a study in contrasts. Astronomers seek out plots of land over which light pollution is ideally absent to better see the dimmer light of distant stars. Yet, there now comes a growing shadow that will hide from us the closer ones. 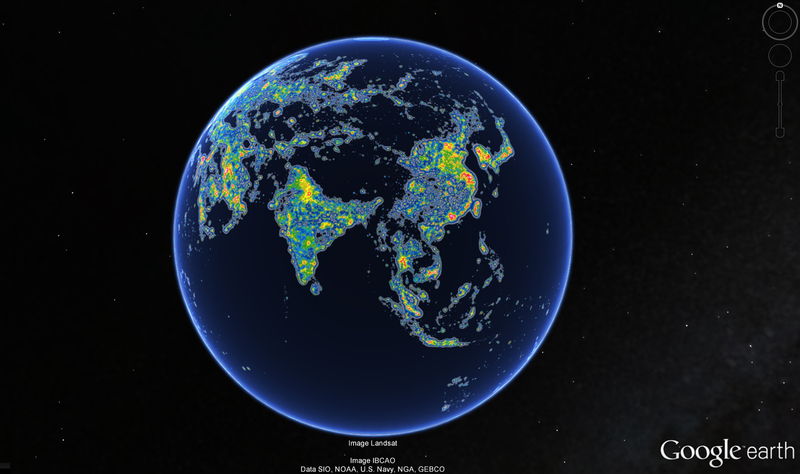 How bright is the world at night? Legend: pristine sky; degraded near the horizon; degraded to the zenith; natural sky lost; Milky Way lost; people can’t adapt to night vision.